By default, your newest articles are published at the top of your blog. With every new article published, your existing articles are pushed down a spot — and eventually, off the front page completely. Of course, if your article is one of your main conversion drivers, you want to do everything you possible can to drive traffic to it. One of your options is to make a post ‘sticky’ — sticky posts are displayed at the top of the blog, meaning they get most visibility and a constant supply of the homepage’s link juice. Creating a sticky post is also a great way to ensure your website’s announcements are prominently featured. Not sure how to do this? Today I want to show you how to make a post sticky in WordPress. Creating a sticky post is actually incredibly easy. To start, create your new post as you normally would — from the WordPress dashboard, head to Posts > Add New. 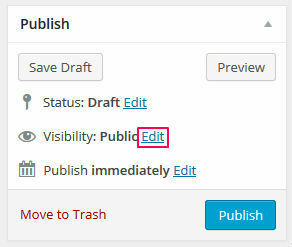 When you’ve finished writing your post, head right of the WordPress visual editor to the Publish meta box. See where it says Visibility: Public next to the eye symbol? This is what we need, so click the Edit button next to it. This will open a few more options for you, including the opportunity to password protect the post, make it private, and the option we’re looking for: Stick this post to the front page. Tick the checkbox, then hit OK.
Now when you hit Publish, your post will remain at the top of your blog. Yeah, that’s all there is to it! It’s really easy and should take no more than a few seconds for you to do. It’s possible to go back and make an existing post sticky, too, which is done by following the exact same steps. If you want to stop the post ‘sticking,’ just head back into the post and untick that same checkbox. Be aware that when you do this, your post will then be ordered by when it was published, not when you removed the sticky status. If your post was published a while ago, be prepared for it to fall a long way down. All blog posts start life at the top of the blog roll. Over time they get displaced by newer content, though, and gradually slip down the order. For some posts this is undesirable — perhaps your post provides important information or is by far your most profitable. 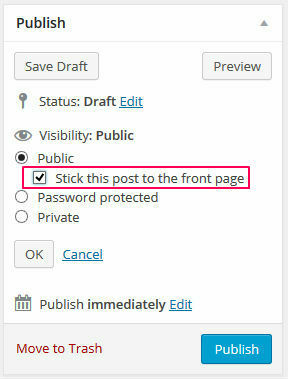 In such scenarios, you can keep a post at the top of your blog by using WordPress’s sticky post feature. It’s really easy to implement, and can give your important posts the extra visibility they need. Any questions about sticky posts? Ask away in the comments section below!